Being a guy who has suffered from the illness of "guitar-o-mania" since I was a kid, I had no choice but to surround myself with strats, teles, les pauls, sgs, double-necks and even an occasional piece of art like a jimmy page davoli!...not to mention a breath-taking 60's gretsch white falcon. 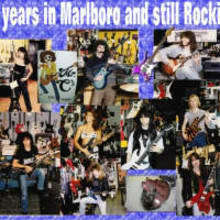 matter of fact through the many years of buying and selling musical instruments, I have been blessed to have some of the rarest and most desireable guitars pass through my store! Be sure to check out our site as you search for your dream guitar!